Immune cells shown to facilitate tumour growth by forming primitive vascular channels. Angiogenesis, the growth of new blood vessels from pre-existing ones, is required for wound healing, menstruation, embryogenesis and various pathological conditions including tumour growth. Macrophages, key cells of the innate immune system, are known to support angiogenesis but are not believed to directly form vessel walls. Now, a study from researchers at The Scripps Research Institute shows that macrophages can drill through tumours to create new vessel-like structures for delivering oxygen and nutrients as tumours grow. The team state their research may represent a whole new therapeutic target for limiting tumour growth, through targeting macrophages. The opensource study is published in the journal Scientific Reports. Previous studies show that blood vessels are normally built by endothelial cells. In cancer, tumour cells can induce endothelial cells to build new vessels to bring in blood rich with oxygen and nutrients, a process called angiogenesis. Recent research has revealed that not all vessels are lined by endothelial cells, however. In cancer, vessel-like structures can be created by a non-endothelial cell type. This phenomenon, called vascular mimicry, has been observed in several types of solid-type tumours, including glioblastoma, breast cancer and melanoma, and has been attributed to cancer stem cells. As in physiological and developmental angiogenesis, macrophages in tumours are believed to play a supportive role in this process. The current study shows that macrophages can form vascular mimicry channels in tumours, as well as in other low-oxygen environments. 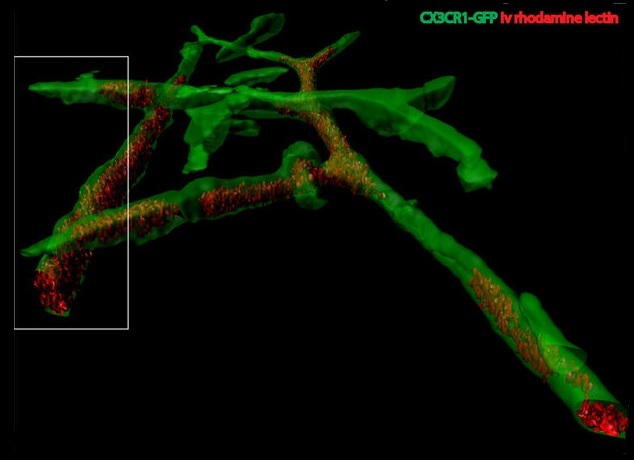 The current study uses an intravenously injected dye to delineate the established vasculature as well as the newly formed vascular mimicry conduits, to show that macrophages quickly migrate to oxygen-deprived environments and form these vessel-like channels. Results show that these tubular structures are lined with cells that express macrophage cell surface markers which can be re-programmed within the tumour environment to promote tumour growth. Data findings show that these conduits have an architecture distinct from that of traditional blood vessels. The lab state that their findings could explain why current drugs to slow angiogenesis do not slow tumour growth in some patients. They go on to add that future cancer therapies could starve tumours by combining current vessel-targeting drugs with drugs to influence macrophage activity. The team surmise that their findings provide an additional structural role for macrophages in the formation of a primitive tubular network in both subcutaneous matrigel and tumours. For the future, the researchers state that in addition to providing a new approach to cancer, studies could focus on better understanding how macrophages influence retinal angiogenesis and blood flow in the eye, a key concern for people with diseases like age-related wet macular degeneration, where leaky vessels can cause vision loss. Macrophages form functional vascular mimicry channels in vivo. The macrophage network is a functional vasculature. Barnett et al, 2016.